I was lazy, I didn't think it would cause any harm, but it did. And now they are back. 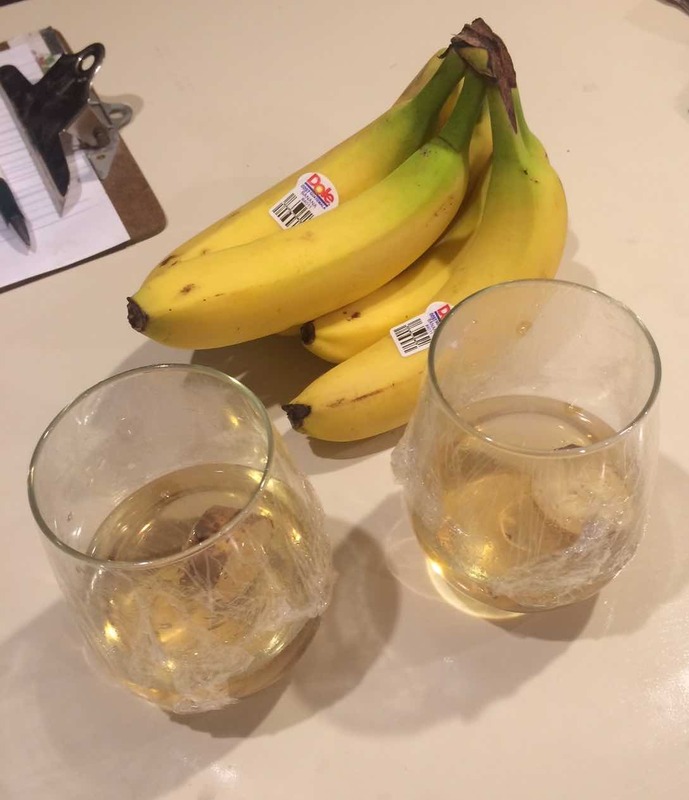 The fruit flies have taken over my kitchen, and I need help fighting them. Story: I was preparing a must for homebrewing a batch of forest fruit wine. This all went well, the wine began fermenting and I was left with 4lb of warm soggy fruit mush. I tactically decided that the best place to dispose of this was in my inside kitchen bin. Naturally the next morning I woke up to discover hundreds and hundreds of fruit flies in my kitchen, feasting on the fly-superfood in my bin. Question: What is the best method of killing/removing the fruit flies from my kitchen? I have already emptied, cleaned, and sterilised the offending bin, but the flies seem to be okay with not having a food source anymore. Will they eventually leave/die from lack of food? Can I drive them out with a smell or incense? Should I just commit mass insecticide and sweep them up afterwards? As I’ve recently tried to much success, sucking the bastards with a vacuum cleaner is easy, fast, ruthlessly efficient, and unlike sticky liquid contraptions, it doesn’t carry the risk of accidentally turning into a food source for the flies. Put some strong smelling vinegar, like apple cider vinegar, in a glass and make the trap by making a cone with a sheet of paper. The strong sweet smell will attract them and they won't be able to get out of the glass. Remove anything that can be food, especially fruit. Put it in closed containers, in the fridge etc. Wait. They don't live long and just die off. That can be as fast as one day, probably because of the lack of food. (Surprisingly, their average natural life span in optimal temperatures is 40 to 50 days, but I have never experienced that. I'm living in a moderate climate). If you want to hasten step 2, use a towel to kill as many as you can. In the absence of food, they tend to land on window panes. Just slap them with the towel. I have also used a bowl with some fruit peels, left it standing overnight. The following morning place a lid or plate over it, and move it all outside where they'll escape. The trick is placing the plate very quickly, before they have a chance to fly off indoors. Poke holes in the lid of the container. They should be large enough for the flies to crawl through, but not large enough for them to fly through. You'll end up catching a lot of flies. After a day or so, you might want to dump the containers out and add new liquid. It might take a week to get rid of all of them, but you'll have it significantly reduced within a day. A Nepenthes Ventrata, for instance, requires regular watering and temperatures in the 15-25C range, but is an otherwise fairly low maintenance plant. I used to be a chef. A trick I learned was to leave maybe half a bottle's worth of beer in a bottle and leave the bottle. They'd go in there and drown. Usually solved the problem in two or three nights if it was really bad. Something else super simple is to tie your trash bags, but leave a tiny bit of an opening. Leave them like that overnight, the flies go in, and in the morning you just seal them in and get rid of the bag. Make sure there is something attractive in the bags or they won't go in. Slow method: a little wine in a tray (looks like other substances work too). Fast method: Nozzle attachment from my vacuum cleaner. Works with other bugs too although you have to sneak up on flies unless they're the slow-moving kind. I think the absolute best way to kill them is with a bug zapper. There are many (indoor) bugzappers available for about $40 on amazon. I've rarely been so happy with a purchase. Every day mine kills more bugs (big and tiny) than I ever would have guessed or liked to imagine were even in my house. The blue light is not exactly classy so part of me wishes I could turn it off but it gets so many bugs per day I can't imagine stopping the process, and letting that many bugs go unkilled. 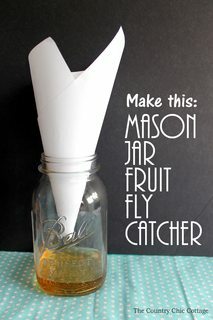 Notably, fruit flies in particular are NOT attracted to the light of the bugzapper however, so you have to take it one step further. Get a little container (tupperware etc) and throw some banana peels/fruit scraps into it (as bait) and then lay the bug zapper on its side over the top of the container. You'll hear so much popping you won't beleive it. Some of the flys will make it to the fruit by luck avoiding the zapper contacts, so occasionally give it a thump to disturb them and get them to take flight. You'll get like 30 pops at once. The easiest and most successful trap I've used (and I've tried some of the above) was a small dish with vegetable oil and a blot of cheap balsamic in the middle. Balsamic brings them in, vegetable oil traps them. Grab one or more drinking glasses. Drop a piece of fruit into some water, add some vinegar if handy. Stretch taut a piece of Saran Wrap-style plastic over the glass. If not tight, wrap a rubber band around. Poke two or three tiny holes with the tip of a knife. Very small holes. The fruit flies slip through the tiniest of spaces, kind of amazing. The idea is for them to slip into the glass, drawn by the delicious-smelling rotten fruit aroma, but render them unlikely to find their way out. Gently stir these together in a small dish and place it on your counter. The dish soap prevents surface tension from forming and when the flies attempt to drink the vinegar they are trapped and drown quickly. What my parents did when we had a bit of a fruit fly problem was take a plastic container of some sort (really it doesn't matter what material it is), put some fruit peels and cores in it, then cover its opening with plastic wrap and poke some small holes in it. The flies will be eager to get in and unable to get out (except for the odd one with some sense) because they can't tell that the film is in their way (they have like 0 brain after all). I separate my veg peelings and food scraps from other household waste. The fruit fly' inevitably get into this. I wait, usually in the morning, and catch most of them by quickly closing off the neck of the bag. I release them. I don't tie the bag off but return them to benign climbs usually via the bin chute. There are always sentry flies patrolling the vicinity of the bag so I don't get them all, but by now I treat them more like pets than a nuisance. As long as I keep the rest of the kitchen clear of fruit fly food they pretty much stick to the vicinity of the scraps/composting bag. They no longer seem to see me as a threat and have stopped flying directly at me when i disturb them. I have occasionally tried the hippy solution and calmly asked them to leave while pointing to an open window. YMMV on that one. But I don't mine so much and I'm reminded of the end to 'all the pretty horses' when I'm tempted to get the vacuum out. Something that attracts them, usually the source itself placed outside the window. They will eventually gravitate towards it and once most of them are outside I quickly remove the rotten fruit and close the window. But there are usually some that stay behind. For them I use a flame thrower to burn them in mid-flight. I use a blowtorch that is attached to a gas cartridge. If you turn the whole apparatus upside down the liquid gas will pour through the nozzle throwing a big ball of flames. Just be careful using it close to walls. The oxygen starved flame produces soot that can deposit on the wall. Not the answer you're looking for? Browse other questions tagged cleaning spoilage kitchen or ask your own question. How to remove olive oil stains from cotton/wool cloths? Good way to prevent grease build up in kitchen?